Ashley Koe is the reporter from the news report I linked to in my previous post about the drunken clown lady. She is an anchor for WTOV9, which seems to be based in both Ohio and West Virginia. No, this is not a reference to Heath Ledger's portrayal of The Joker in "The Dark Knight". The creepy specter in the photo above is Patricia Ingalls. 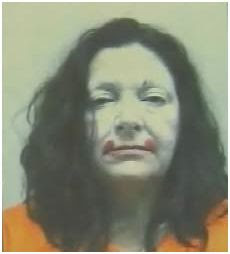 Patricia Ingalls, Professional Clown, was recently arrested at an event while in full clown regalia and witnessed by several children. Ingalls was arrested under the charges of drunk driving and leaving the scene of an accident. According to police, her blood alchohol level was .252, which is more than three times the legal limit. According to Ingalls, as she was led away in haccuffs, the children grabbed on to her saying, "Don't take the Clown!" Don't take the clown. In essence, isn't this what we're all saying? Okay, maybe not, but it is a funny story. Hell, what that involves a clown isn't funny? She's wearing grease paint in her mugshot for crissake. Here is the story which includes a video interview of Ingalls as she describes the children calling out "don't take the clown." Billy Mayes, ShamWow, Snuggie; none are safe from J-Dubb's Theatre. Kablamo! can take on the loudest of annoying loud guys. But now there's a competitor; ShamPoo! (ShamWow). Who will win this epic battle of carnival callers turned commercial spokesmen? PackRat was one of the hottest buzzwords on Twitter today, but what is it? So, Twitter recently added a feature on it's sidebar called "trending topics". Trending topics is a feature which displays the most discussed keywords on Twitter at that moment. By clicking on one of these keywords, you are linked to a page where you can see all the latest "tweets" which involve that particular word. I decided to experiment with this feature today when I saw that one of the keywords was "Ashton." So I wrote, "this tweet is about the car, Ashton Marton." Sure enough, my tweet ended up in the recent tweets involving the word "Ashton." While I was experimenting, I noticed one particular topic that seemed to be climbing the ranks to the top of the most discussed list. The keyword was, "#packrat." But what is #packrat? It was one of the most discussed words on Twitter, and I had no clue what it was. So, I clicked on #packrat to find out. I found a list full of tweets that ended with the word #packrat, but the context of these lists didn't seem to have anything to do with this word. People were just adding the word onto the end of their tweets. I also saw a few tweets from unknowing people inquiring as to what exactly this #packrat is. One person even tweeted, "cracks me up all these non #packrat people asking what it is." Which, of course, made me want to have nothing to do with #packrat. Cracks me up how every time in life that there's ever been an exclusive group anywhere in the history of life, the universe, and everything, there are always those elitist people who view EVERYONE ELSE IN EXISTENCE as outsiders, no matter how trivial the group may be. Of course people are asking what it is, genius! When you don't know what something is, the next logical step is to... gasp... ask what it is. That's how people come to this mystical realm of knowing what things are. But, I was still curious. So, I did some searching through the list. I gathered that a lot of people were intentionally trying to make it the most discussed word on Twitter. So I Twittered, "What exactly is this, #packrat? It seems to be some new web meme and I might need to blog about it before it gets too old." (I'm not too late, am I?) Instantly, I received four replies answering my question. One person replied, "Not Even - its a game on facebook." I don't think this person understood what I meant by a web meme, but they answered my question. All responses seemed to be quite zealous about the topic, from "It's the best game on Facebook," to "it's this highly addictive game on Facebook." So, I looked up "packrat facebook," and found its homepage. 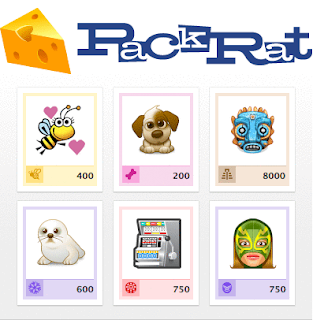 PackRat is an application on Facebook which allows you to collect virtual trading cards. There are a bunch of these images with varying point values on the bottom which you can trade with other people on Facebook who have installed the application. Basically, it's a social networking/make friends online sort of thing. According to the responses I received, it seems that PackRat has been around since January 2008. I guess PackRat is having a release party for releasing some new card designs, so they decided to use Twitter's new Trending Topics feature for publicity. Basically, everyone who was in on it decided to include #packrat in all of their tweets with the goal of making #packrat the number one trending topic. Last I saw, it was up to number two, which is pretty good. All in all, I would say the plan worked. Just getting packrat onto the trending topics list had plenty of people asking, "what is #packrat." Of course, the "what is #packrat" tweets added to the count causing the keyword to cascade even higher on the list. And I'm sure there were a few hitchhikers who decided to join in, not really knowing why they were doing it. As for me, it got me to not only do research into the subject, but to write a blog post about it, which means even more publicity. So on that note; good job all you PackRat enthusiasts, from J-Dubb's Theatre.